I have never actually been a big fan of Avengers comics. I have always identified myself as a X-Men fan. So a title that combines my favorite print hero team with my favorite big screen movie franchise is something I wanted to sample. 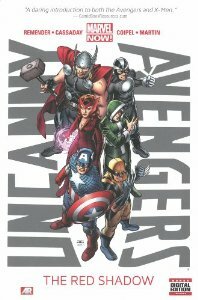 Therefore picking up a copy of Uncanny Avengers: The Red Shadow was a no brainer for me. Scott Summers powered by the Phoenix Force nearly enslaved the entire world in A vs X. Though Summers was misguided, Captain America is convicted by Summers’ comment that Rodgers never did enough to help the mutant cause. He decides he must now do something to aid mutant rights and their acceptance by the public, so he forms a new Avengers team that includes mutants and non-mutants under the leadership of Alex Summers, Havok. The majority of this collection focuses on the newly formed Unity Squad facing off against the Red Skull who now sees mutants as the greatest threat to human purity. Red Skull is empowered by the brain of the late Professor Xavier, expanding the villain’s mental powers. And he is aided by the enhanced S-Men, including the mind controlling Honest John. The struggle is very public as the Red Skull forces the citizens of New York to kill the mutants in their midst. The second major story arc includes discussions of the leadership and public relations plan for the Unity Squad. The story makes it clear that Havok and not Cap leads this team. Havok is in control! Or is he? That is one of the big questions throughout this volume. The team debates if the real leader is Summers or Rodgers, with many Avengers questioning how Rodgers could give up the mantle to the brother of Scott Summers! Let us be honest. Captain America is a pretty straight forward guy. So despite that fact that he carries a leadership aurora with him wherever he goes, one believes him when he states that Havok is the team leader. And that makes some of Rodgers actions in that tension seems predictable. The other tension is related to Scarlet Witch and her membership on the team. She is a mutant, but more identified with the Avengers. And she is the trigger for former hero Scott Summers attempting to create a utopia using the Phoenix Force powers to restore mutants after the Scarlet Witch wiped the majority away. There are a lot of relationship issues as the mutants hate her due to her horrendous act and the fact she has stayed away from mutant tensions under the Avengers flag. And there is romantic tension with the men of the team like Wonder Man and maybe Captain America. And there is the complication that Rogue had a romantic relationship with the Scarlet Witch’s villainous father Magneto. Yeah, it is all a hot mess of a soap opera! Marvel NOW! is to serve as a jumping off point. It is not a reboot but a good place for new readers to jump in, with me guessing most of those new readers coming from the MCU. And I would say that Uncanny Avengers: The Red Shadow succeeds in that goal with a good story and new team that will catch reader interest.